Depending on the size of the boat, between ten and twenty paddlers sit side-by-side to paddle a dragon boat. To move the boat well, each paddler must not only pull water using a good technique, but must be synchronized with her fellow paddlers. The Los Angeles Pink Dragons is a competitive team and each member is expected to train to develop and maintain a level of fitness that will help the entire team achieve success. You do not have to have paddling experience to join our team. 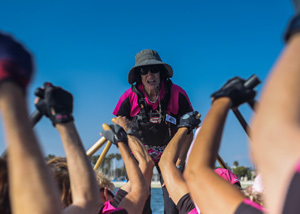 In addition to being a breast cancer survivor, you need the desire to become a Pink and the dedication to be an active participant in training, on and off the water. If you want to meet us and see if dragon boating is what you’ve been looking for, please click here. The best way to decide if paddling is a good fit for you is to come to practice and give it a try. The membership chairwoman will contact you to answer any questions and let you know what to expect your first day. She will coordinate the best day to paddle to ensure that there is room on the boat and equipment available for you to use. We occasionally will need to limit or postpone guest paddlers subject to our schedule, attendance, and upcoming races. Guests must also complete a waiver and an emergency information card prior to participating in a practice. Before getting on the water, you will receive basic instructions on paddling techniques and safety. You’ll get a warm welcome from the Pinks and someone will help you get geared up. We hope you enjoy dragon boat paddling and want to come back for more!